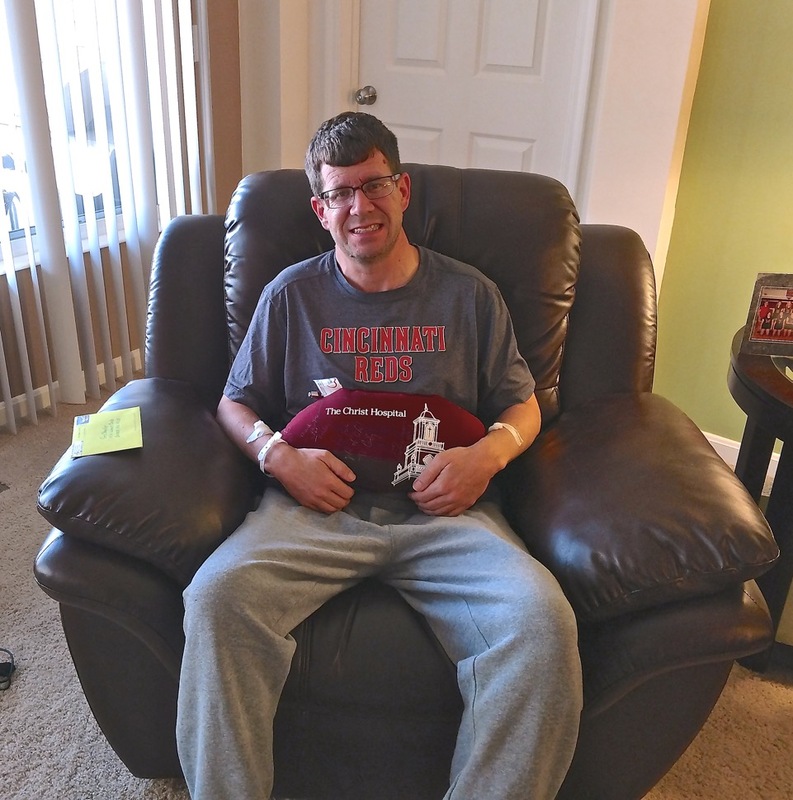 Greg Chandler on the road to recovery after donating a kidney as an altruistic donor. I did not know my recipient. The only information that I was given was her approximate age and the region that she was from. In April of 2016, I was looking on Facebook and saw a posting about being a kidney donor. A woman that my family knew needed a kidney transplant and her daughter was asking for people willing to be tested. I immediately went to tell my wife about this post, and to tell her I wanted to look into it. Over the next few months, I went through the testing process and discovered that I was not a direct match for this particular woman. I was given the option of being in the kidney paired exchange program, an opportunity given to those who are not a direct match for someone. For over a year, I remained in the exchange program. It was a long stretch of time, but I continued to believe that it would still happen. In August of 2017, my exchange program partner found a direct match and was going to be receiving a kidney. As a result of this great news, I was given two choices by the transplant coordinator: I could remove myself from the exchange program and not donate, or become an altruistic non-directed donor, meaning I would donate to anyone that I was a match with. A few weeks later, I had a recipient for my kidney. Being a kidney donor was an easy decision for me. Once I made up my mind, nothing was going to stop me. It was something that I wanted to do for a long time, and even more than that, something that I was believed I was meant to do. When people asked the what if questions about the future, I responded that I am living in the present. The future would take care of itself. Once I found out I was going to be a donor, my biggest concern was that something would happen to prevent the transplant from taking place. I was excited and did not want anything to get in the way. I felt that my coordinator and everyone involved in the process had done a great job of preparing me for what to expect. My family was extremely supportive of my decision to donate. Nobody tried to talk me out of it. My friends did not quite know what to think. The school where I teach gave me a lot of encouragement and prayers. Donating was something that I did not talk much about because I did not want to come across as "look at me, what a great person I am." I remember being in the operating room with the surgeon standing right next to me waiting to begin. The anesthesiologist put the mask over my mouth, and then I was in the recovery room with my wife feeding me ice chips. The surgery lasted a little over three hours. My recovery went very well. The pain medication definitely worked and reduced the amount of discomfort. I ate very light on the day of surgery. Switching from laying down to sitting up was the hardest part in terms of pain. Once I was allowed, I got up and walked the hallways as much as I could, pulling my IV stand behind me. It felt good to get out of my bed and move around. I walked several laps the second day I was at the hospital. I am definitely glad that I decided to stay an extra day. Greg takes it easy at home after a successful kidney donation. My recovery at home went smoothly as well. I only had to take the pain medication for a couple of days, which was a nice surprise. My appetite came back fairly quickly, and I was able to eat normally. I also took quite a few naps during the day. I walked outside a great deal to build up my stamina. I did have to bring the catheter home with me, as I was having trouble going to the bathroom. That lasted a couple days. Apparently, that is more typical for men than women. The hardest part of the recovery for me was not being able to be active and get back to my normal routine. Because the recovery went well, I felt like I could do anything. However, I did take it easy and allowed my body to completely heal. The entire process took a year and a half. I went through three different phases during this journey: I started by trying to be a direct match, to then joining the paired exchange program, to finally becoming a non-directed donor. Each part of the process increased my desire to donate even more. I continue to be surprised by the incredible number of stories that show up on the news regarding kidney donation since my surgery. There are so many people in need, and it is exciting to be able to share with people how the process works. I am hopeful that some of my friends will pursue this opportunity as well. If I had an extra kidney, I would gladly donate again. It was one of the greatest decisions of my life.